Classic Style for the Modern World. The Metropolitan makes life more fun. Now you can get around town without any hassles. Traffic? Please. Can’t find parking? Yes, you can. High gas prices? Not an issue. All you have to do is put on your helmet and enjoy the ride. Sure, it looks cute in new Coastal Blue or Pearl Soft Beige, but underneath that curvy bodywork, it’s pure Honda. It has a fuel efficient, liquid-cooled four-stroke engine, a no-shift automatic transmission. All you have to do is turn the key, press the electric starter, and go. It even has lockable underseat storage, perfect for grocery runs. The Metropolitan may be endlessly practical, but when you ride it you’ll see it’s also endlessly fun. V-MATIC AUTOMATIC TRANSMISSION: The Metropolitan’s multi-speed automatic transmission means no shifting ever—not even into park or neutral. Just turn the key, press the starter button, and go! 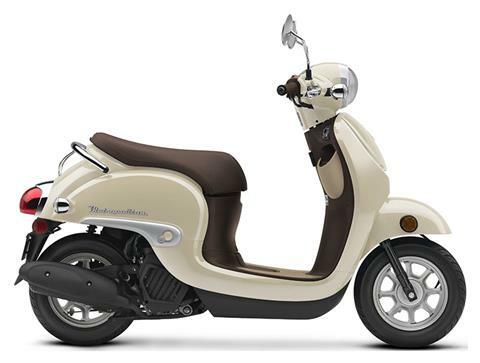 PROGRAMMED FUEL INJECTION (PGM-FI): The Metropolitan features a liquid-cooled 49cc four-stroke engine with fuel injection. It’s quiet, economical, and super reliable—everything you’d expect from a Honda. 22-LITER UNDERSEAT STORAGE: The Metropolitan features a large under-seat storage area big enough for a helmet, your books, or some groceries. The storage area features a lock for added security and is weather-resistant too. INSTRUMENTS: A clean, stylish instrument panel is right in line with the Metropolitan’s smart design. CONVENIENCE HOOK: A super easy way to hang a tote, grocery bag, or purse strap, the hook is big and easy to use. COMBINED BRAKING SYSTEM: Activate the rear brake, and CBS automatically adds front braking to help you stop. ALWAYS WEAR A HELMET, EYE PROTECTION AND PROTECTIVE CLOTHING. NEVER RIDE UNDER THE INFLUENCE OF DRUGS OR ALCOHOL, AND NEVER USE THE STREET AS A RACETRACK. OBEY THE LAW AND READ THE OWNER'S MANUAL THOROUGHLY. For rider training information or to locate a rider training course near you, call the Motorcycle Safety Foundation at 1-800-446-9227. Metropolitan is a registered trademark of the Honda Motor Co., Ltd.